As of February 2019, the National Principles for Child Safe Organisations have been endorsed by members of the Council of Australian Governments, including the Prime Minister and state and territory First Ministers. The principles aim to provide a nationally consistent approach to creating organisational cultures that foster child safety and wellbeing. The National Principles reflect ten child safe standards recommended by the Royal Commission into Institutional Responses to Child Sexual Abuse, and are the vehicle for giving effect to recommendations relating to the standards. The National Principles have a broader scope that goes beyond child sexual abuse to cover other forms of potential harm to children and young people. Child safety and wellbeing is embedded in organisational leadership, governance and culture. Children and young people are informed about their rights, participate in decisions affecting them and are taken seriously. Families and communities are informed and involved in promoting child safety and wellbeing. Equity is upheld and diverse needs respected in policy and practice. People working with children and young people are suitable and supported to reflect child safety and wellbeing values in practice. Processes to respond to complaints and concerns are child focused. Staff and volunteers are equipped with the knowledge, skills and awareness to keep children and young people safe through ongoing education and training. Physical and online environments promote safety and wellbeing while minimising the opportunity for children and young people to be harmed. Implementation of the national child safe principles is regularly reviewed and improved. Policies and procedures document how the organisation is safe for children and young people. Underpinned by a child rights, strengths-based approach. Designed to allow for flexibility in implementation across all sectors engaging with children and young people, and in organisations of various sizes. Aligned with existing child safe approaches at the state and territory level. Download the National Principles for Child Safe Organisations. As part of the Child Safe Organisations project, the Australian Government commissioned the National Children's Commissioner, Megan Mitchell, to lead the development of National Principles for Child Safe Organisations. The National Principles were developed in 2017-2018 through a consultation process that included Australian governments, national peak bodies from sectors that work with children and young people, national advocacy and research organisations, and children and young people. The National Children’s Commissioner undertook targeted consultations in the first half of 2017 with Australia’s Children’s Commissioners and Guardians, the National Coalition on Child Safety and Wellbeing, and peak organisations from key sectors such as health, education, sport and recreation. The National Children’s Commissioner also met with Royal Commission representatives involved in the development of the child safe standards. In October 2017, Community Services Ministers in Commonwealth, State and Territory Governments endorsed draft National Principles for further consultation. The National Children’s Commissioner established two advisory groups to assist with development and implementation of the National Principles. The list of advisory group members is available here. In January 2018, the Child Safe Organisations project held a forum on cultural safety for Aboriginal and Torres Strait Islander children and young people, which sought feedback on the draft National Principles from a cultural safety perspective. The draft National Principles were refined through consultations held between October 2017 and March 2018 with representatives of the sports, disability, health, education, early childhood, arts and recreation sectors; child and family support services; and religious bodies. The National Children’s Commissioner also consulted with children and young people about what was important to them in terms of safety and wellbeing. As of February 2019, the final National Principles have been endorsed by members of the Council of Australian Governments, including the Prime Minister and state and territory First Ministers. The Royal Commission recommended that all institutions in Australia that engage in child-related work be required to implement ten child safe standards, which have been incorporated into the National Principles for Child Safe Organisations. In June 2018, the Australian Government tabled its response to the Royal Commission’s recommendations. As one element of its response, the Australian Government established the National Office For Child Safety in July 2018. The key activities of the National Office will include leading national coordination and implementation of the National Principles, working with the National Children’s Commissioner, states and territories and the non-government sector. In order to allow flexibility in implementation, and in recognition of the variety of organisational types, sizes and capacities, the National Principles outline at a high level the ten elements that are fundamental to making an organisation safe for children. The National Principles include guidance to help leaders, staff and volunteers in organisations understand the important aspects of creating a child safe culture. Each principle is accompanied by key action areas and indicators. 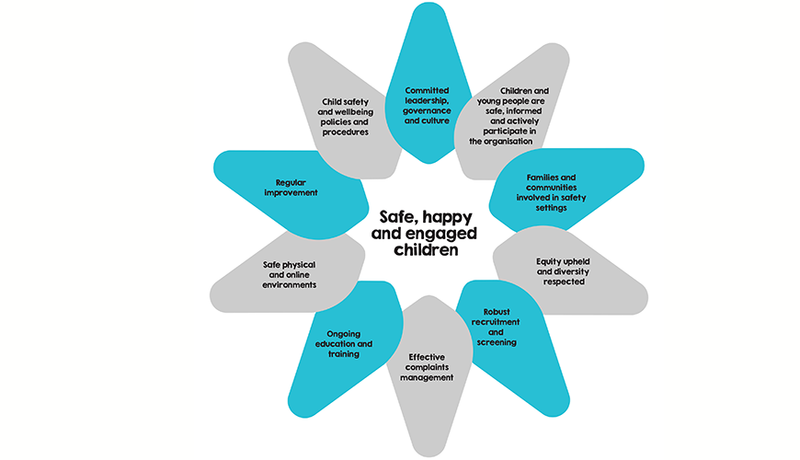 The key action areas reflect the core components of the Royal Commission’s child safe standards. The indicators act as a guide as to whether an organisation is implementing that principle in practice. Practical tools and training resources are available to help organisations implement the National Principles. At present, the National Principles are not mandatory. However, organisations that implement them will be demonstrating their leadership and commitment to child safety and wellbeing. These organisations will become ‘organisations of choice’, because children, young people, families and communities will feel confident that they provide safe environments where children’s rights, needs and interests are met. Organisations that engage with children and young people must continue to meet existing child safe requirements in their state or territory. This includes background check schemes for those seeking to work or volunteer with children. Links to state and territory child safe requirements and resources are available here.